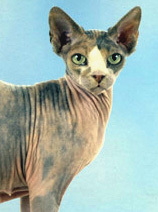 Welcome to sphynx site. Click on photo to see more. 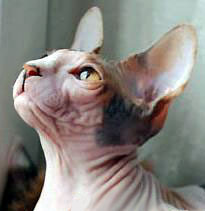 Here you can see my sphynx cats. 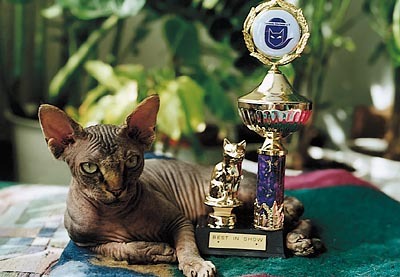 I'm breeding quality show cats. 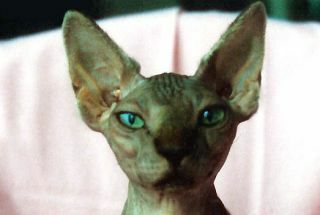 Ich will eine kleine (wahre) Geschichte erzählen, wie ich das erste Mal 1994 mit Sphynxkatzen in Kontakt kam und mich in sie verliebte...Es war einen Tag vor meiner Abreise aus Los Angeles als ich einen Anruf von Leslie bekam, "Oh du musst vorbei kommen, ich habe eine Überraschung für dich." Ich wunderte mich was es wohl sei und fragte, "hat es 4 Beine, oder hat es 4 Räder?" Ich wusste nämlich, Leslie hatte zwei Leidenschaften, Sportwagen und diese nackten mexikanischen Hunde mit dem unaussprechlichen Namen. "Okay Leslie, für die Räder komme ich, für die Hunde nicht, dafür habe ich zu wenig Zeit." Leslie sehr eindringlich "Aber wenn du nicht kommst, vermisst du ein ganz entscheidendes Ereignis in deinem Leben." Nachdem ich die vielen Meilen bis zu ihrem Haus gefahren war, sah ich kleine nackte vierbeinige Baby's. Leslie bat mich ruhig zu bleiben und mich zu setzen, dann sagte sie "das sind Katzen, keine Welpen...KITTEN !" Ungläubig nahm ich zwei von ihnen in meinen Arm. 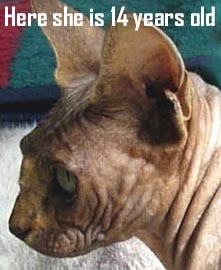 Ich war sofort total fasziniert und fortan infiziert mit dem "Sphynxbazillus." 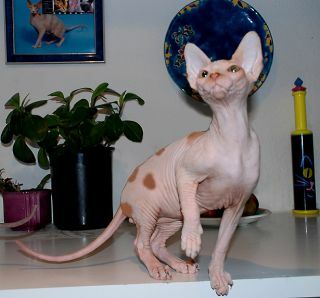 Diese sehr warmen und weichen Geschöpfe verzauberten mich umgehend mit ihrem Charme und nur Leute die das Glück hatten eine Sphynx für eine Weile zu halten, können das verstehen. 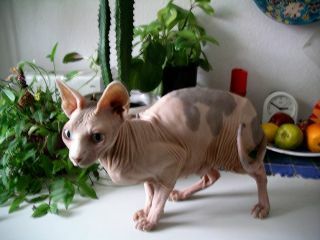 Es dauerte zwei weitere Jahre bis ich endlich meine erste Sphynx bekam, eine Blacktortie, die Farbe die ich am meisten mag. Es war der Beginn einer wundervollen Liebesgeschichte die bis heute anhält, ja eher noch stärker geworden ist. 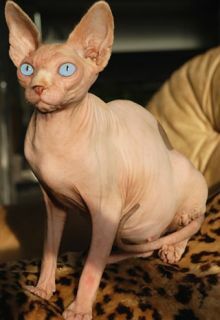 Sphynxen bringen soviel Erfüllung und Freude in dein Leben und Katzenliebhabern entgeht wirklich viel, wenn sie nie eine Sphynx besessen haben. 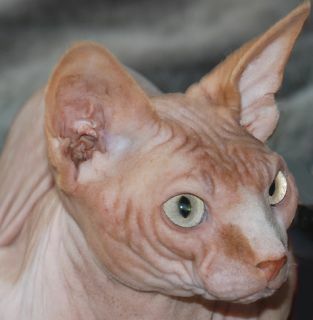 I would like to tell you a little (true) story about how I came into contact with Sphynx cats for the very first time—it was in 1994—and how I ended up falling in love with them. It was the last day before I left <?xml:namespace prefix = st1 ns = "urn:schemas-microsoft-com:office:smarttags" />Los Angeles when Leslie called, "Oh you must come! I have a big surprise for you!" I wondered what it was and asked, "Has it got 4 legs or 4 wheels?" This was because I knew that Leslie had two passions, sports cars and those naked Mexican dogs with the unspeakable name. "Okay Leslie, I’ll come if it’s wheels but not for the dogs because I have no more time left." Leslie very pointedly said, "But if you don't come, you will miss something that could be a very decisive event in your life." After I drove all the way to her home, I saw little four-legged bald babies. Leslie asked me to be quiet and sit down, and then she said, "These are cats, not puppies...KITTENS!" I picked up two of them and was immediately very fascinated and henceforth infected by the "Sphynx bug." These very warm and soft little “somethings” enchanted me completely with their charm, and only people who are lucky enough to hold a Sphynx for a while will understand what I mean. It took 2 years till I got my own Sphynx, a black tortie, the color I love most. 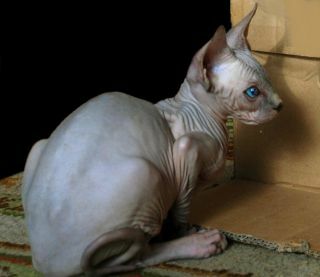 This was the beginning of a wonderful love story, because a Sphynx brings so much satisfaction to your life, and cat lovers will miss out on a great deal if they never own a Sphynx.